Part of the entertainment at Diwali celebration in Whangarei on Saturday. A bumper turnout at Whangarei's Diwali celebration was arguably the biggest crowd drawn at the Hindu festival of lights over the years. Close to 400 people attended the event at Whangarei Intermediate School on Saturday for an evening of entertainment and vegetarian food provided by Hare Krishna - all for only $5 per head. All proceeds went to the Hare Krishna Food for Life programme that provides 1000 free school lunches at three Whangarei schools. 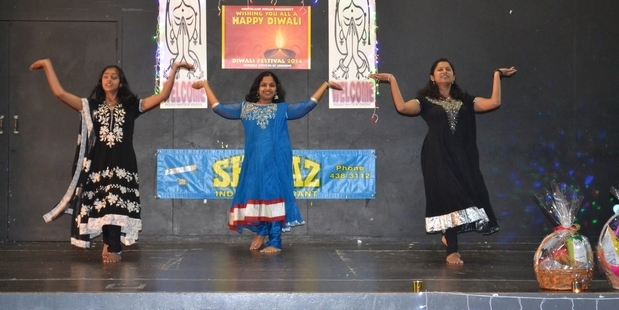 Diwali Fest, organised by the Northland Indian community, started with a prayer by Food for Life founder Buddhi Wilcox before Whangarei MP Shane Reti was invited to speak. South Indian and Bollywood dances formed part of the entertainment performed by primary and secondary students, as well as women. A punjabi song and dance was also thrown into the mix and everyone irrespective of ethnicity or religious beliefs was invited to join the fray. An organiser, Rajesh Mistry, paid tribute to his friends and everyone who helped make the event a huge success. "The feedback we got was that everybody really enjoyed the entertainment and food provided by Hare Krishna and I think the crowd was the biggest we've ever had." He said some people came in after ticket sales stopped but there was ample space for everyone to enjoy the evening. "Thanks to everyone for taking part. Your participation added colour to the occasion," he said. Deepawali, or Diwali, is also known as "the festival of lights", because on this day, people illuminate their homes and premises with colourful lights.